y = Ax + B for coordinates N1, E1 and N2, E2. 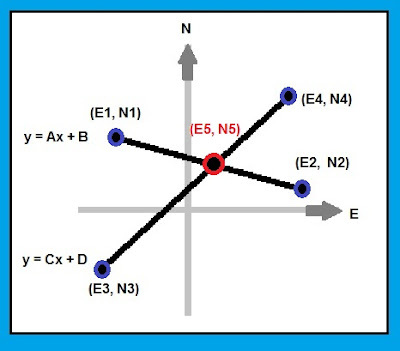 * The intersection of the two lines, labeled by point N5, E5. Keep in mind N is for North (y axis) and E is for East (x axis). Note: Initialize all the variables by choosing option 1, SETUP. Choose 2 for input, 3 for equations of the lines, and 4 for intersection. Line 1: N1 = 0, E1 = 1, N2 = 7, E2 = 2.